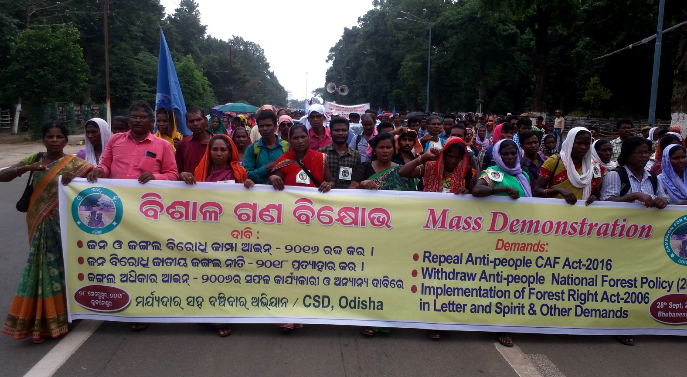 Thousands of adivasis and forest dwellers from across Odisha, mostly from tribal regions, marched in a protest rally on September 28 under the banner of Campaign for Survival and Dignity (CSD), Odisha, at Lower PMG, Bhubaneswar, raising concern over “anti-tribal” and “anti-forest dweller” laws like Compensatory Afforestation Fund Act, 2016 (commonly known as CAMPA) and Draft National Forest Policies 2018. The protest rally was followed by a public meeting at Lower PMG presided by Narendra Mohanty, core body members of CSD. Among those who addressed the public meeting included Anna Kujjur, Suresh Panigrahi, Karmi Besra, Balraju Gemel, Trilochan Punji, Radhakanta Sethi, Akhya Pani, Sala Marndi, Lochan Bariha, Bijaya Upaddhyay, Pradipta Nayak, Kamal Saimajhi, Sandeep Pattnayak, Bijay Swain, Biranchi Bariha and others. At the end of the programme, a of delegation from CSD met and submitted memorandum to the Odisha governor and the chief secretary, demanding that the “anti-environment and anti-people” Compensatory Afforestation Fund Act, 2016” should be repealed, as it seeks to reverse the forest rights recognised under FRA, 2006. The memorandum said, the Ministry of Environment, Forests and Climate Change (MoEFCC) should withdraw the guidelines (F.No.11-423/2011- FC, of 8 Nov. 2017) for creating “land banks” from revenue and degraded forest land to raise compensatory afforestation, adding, the state government should refrain from bypassing the “authority” of gram sabhas in FRA. Other demands included dissolution of joint forest management committees, mandatory approval of gram sabha for any forestry activities within community forest resource areas of gram sabhas, recognition of individual forest rights of of other traditional forest dwellers (OTFDs), and so on.